Every mistake is a design opportunity. And so it goes in the battle of learning Argentium silver. When I attempted to fuse the fine silver and gold pieces onto the Argentium base, the gold sank right into the silver at the top of the brooch and seemed to alloy to the point of not even being able to see it. Ronda had warned me that the gold would tend to heat faster and cause issues. Now I see what she meant. I ground out the remains and replaced the gold, thinking that I would add the one piece carefully and stop earlier, but again it got away from me. This large piece is clearly hard to heat and monitor evenly. And in the course of trying to stop short for the sake of the gold, I fear I have under-fused other pieces onto the Argentium. That became clear when I started cutting out the brooch and a few granules popped off. So now I've cut off all the troublesome parts and soldered on large granule decorations along the edge. I'm reading this as a case of gold being superfluous to this design, so I'm sticking with all silver. The open, soldered granules give a lot more interest to the back of the brooch, so perhaps the lost battle is a good thing in the long run. 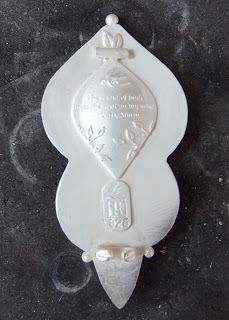 The quote and hallmark are also in place, and now it's time to finesse the fit on the stone. Working with traditional fabrication is frustrating in some ways. I'd hoped that using Argentium for the majority of the work would reduce materials costs, but so far I'd say that's far offset by labor costs. Hopefully, my experience will improve my success rate. 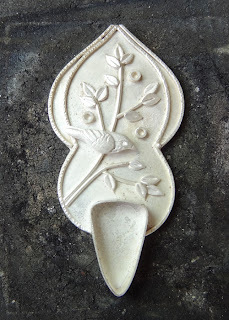 I know I can make what I see in my head with metal clay, but the combination of metal clay with Argentium is still a learning process for me. Right now, it's telling me to start over. ;-) More problems have arisen. I think I'm supposed to learn how much faster I can make it the second time.